The chilly air has arrived and i'm craving warm, earthy comfort food. I love roasting potatoes, especially in the fall and winter, because it's so simple, yet incredibly comforting. Roasting in the oven helps the potatoes get those brown, crispy edges we all love, and brings out the natural sweetness in the onion. These potatoes are the perfect accompaniment to any fall or wintry entree, and are actually perfect for brunch too. I'm always making roasted red potatoes and onions, but in honor of fall I thought i'd add in a sweet potato for good measure, a whole new level! You can always mix it up by adding different types of onions or potatoes, carrots, mushrooms or your favorite veggies. Preheat oven to 425. 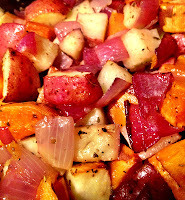 Roughly chop the sweet potato, onion, and red potatoes into chunks. Arrange in a casserole dish and drizzle with olive oil (start with half the olive oil and add as needed to evenly coat all potatoes). Season with herbs de provence, salt, and pepper. Transfer to oven and cook for 1 hour, stirring every 20 minutes or so. Enjoy!